Songs can often bring out deep contemplation, or at the very least, potent awareness that a season is happening and somehow, this song [fill in the blank] is speaking volumes into my minutes and hours and experiences. At work I’ll listen to an abundant variety of music. Thank you earbuds. Depending on the day will depend on what I think will accompany me through the hours, spur me on, motivate me, soothe me, develop in me whatever is necessary. I love the power that music has, in this regard. Not long ago, the artist was Tenth Avenue North. Their twenty-five songs I have stored in my iTunes were the backdrop to focusing on truth – which I knew driving to work that morning – was something of which I was in deep need on this particular day. On this one particular day at work, as the guitar strums the entrance and the voice shapes the melody – I fought back the urge to lay my head in my hands and repent through tears and sorrow…how much I needed Him. Instead, I shed a few tears while keeping mostly composed. I kept typing, but I had words of my own forming and swirling. I know I need You. I need to love You, Lord. I love to see You, it’s been so long. I long to feel You. I feel this need for You. I need to hear You, is that so wrong? The twinge of recognition, it comes. I’m not oblivious in these moments. When my heart turns dark with bitterness, envy, defensiveness. When even legitimate hurt can give birth to disfigured beliefs. I know the recognition is the loving but firm pull of the Spirit. Discerning. Holding me accountable to how I know – and I do know – which is truth and which is trap. I’ve been struggling with a feeling of rejection recently – though I hesitate to name is so harshly because even within the initial hurt, I don’t believe the slight was or is intended and I’m fully aware that I can read too much into a situation where often it’s not nearly as between-the-lines as I perceive. Still, even though I know that it’s probably “nothing”, I find my pride bruised and my measure wanting and my worth waning. And it’s in my control to turn the switch. To not let pain, however large or small, wreck my internal view. To declare instead the true holder of my worth – the true author of my identity. No human has that capability to define another, including me, and I live far too long in the inhabitable space between idols and KING. Are you done forgiving? Or can you look past my pretending, Lord? I’m so tired of defending what I’ve become. It’s evident. The longer I allow myself to go without truly seeing Him, being aware of Him by dousing myself in Word, Light, Truth….the harder it becomes to stand tall in identity. When this occurs, when I arrive back at this layover between humbled and haughty, I know before I have time to choose: I need to lose. I need to lose my preconceived beliefs about who I am, what I’m worth. I need to lose my [false] control. Over situations. Opinions of others. I need to lose my distractions, apathy, fear. Now You pull me near you….still I’m afraid to tell You all that I’ve done. It’s not like He doesn’t know. 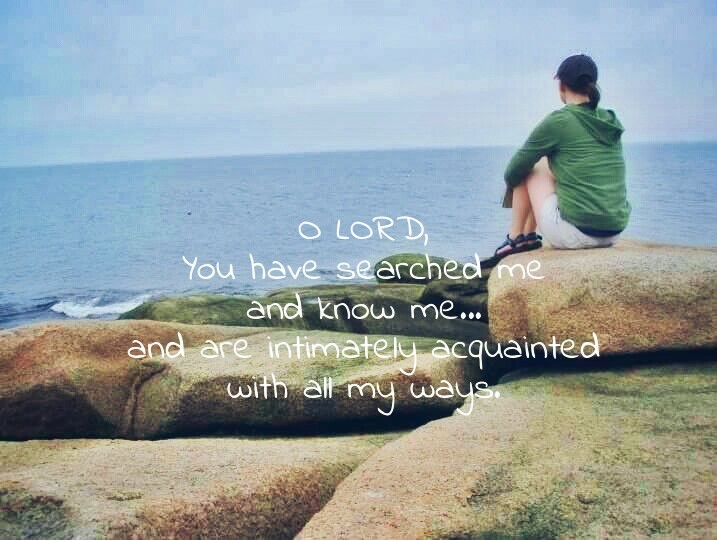 Psalm 139 tells me He is intimately acquainted with all my ways. He know my habits, my weak points, my sensitivities, my lovely, my dark. I am not a mystery to my Maker. Even if I can be mysterious in my own eyes. He whispers my own secrets, introducing me to the heart that beats, the soul that moves, the chest that rises and falls with breath He provides. My love I will keep you by My power alone. On my own – I’m hopeless. I hear sinister variations of measurement and adjectives. This world and our culture is full of them. Distorted qualities to which no one can attain but everyone is demanded. Even within the church (okay, let’s be honest, often especially in the church) we can entangle ourselves in this twisted game of holier-than, stronger-than, just-a _____, not ____ enough and on and on, ad nauseam. We do it not only to ourselves, tragically we do it to each other. He speaks differently about me. He promises to keep me full by His power alone. 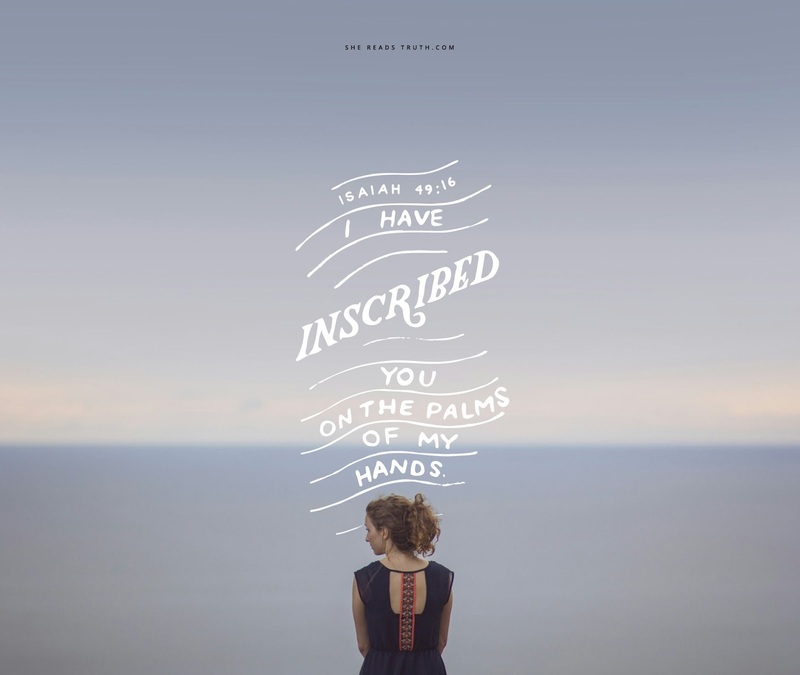 He declared it from a hilltop, stretched thin, open for my name, inscribed on His palms, His head, His feet. I’ve known this since I first said ‘yes’ to His truth. Glory. But I’ve been parched in a desert of my own making – absent from His Word for too long. I allow myself to forget because I ignore the living water that permanently abates all other forms of thirst and hunger and satisfies all my longings. It is this which has allowed me come, wherever I am, to scripted truth, lovely truth from fellow wanders, and visual reminders of nourishment I never have to go without. I cannot encourage you enough, dear sisters….get this app on your phone, your music player – visit the webpage because you can and it’s wonderful and they have thought of every way to make it no longer an excuse but a beckoning to live beneath your true name – your actual identity. It all lies with Him. It is when I leave His fold, I forget myself. I know I need You. I long to feel You.